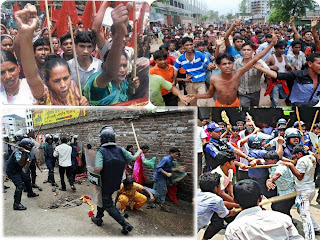 In late May and through June this year, there has been a wave of fierce class struggle in the Bangladesh garment industry. To illustrate the scale of events: around 4000 factories in Dhaka went on wildcat strike, 16 factories were burnt down by strikers and hundreds more ransacked and looted, pitched battles were fought with cops and private security forces in workplaces and workers' neighborhoods, main roads were blocked. Casualties include 3 workers shot dead , thousands injured, several thousand jailed. The Government eventually felt compelled to bring in the Army to restore 'order'. It was a working class revolt that spread beyond the workplace and generalized to involve the wider working class community. At present (early July) the struggle continues in the garment zones on a lesser scale.